1.) The cover page of an important declassified FBI document shows that many top people at theFBI checked off that they had read it. 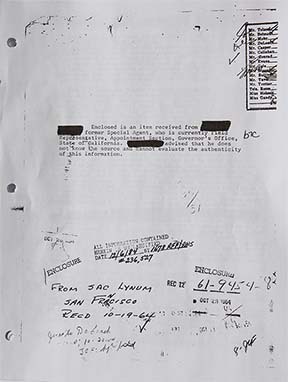 It says it was received in the San Francisco FBI office on October 19, 1964, about two years and 10 weeks after the death of Marilyn Monroe. It is also stamped October 23, 1964, perhaps when it was received in Washington? It is marked as "declassified" as of December 6, 1984, more than 22 years after Marilyn died. However, it was NOT available to the public then, as it should have been. It was refiled and later “dumped out” with many other declassified documents in the 1990’s. 2.) The expurgated FBI document has the title ROBERT KENNEDY. Marilyn Monroe is not referenced in the title, so people researching Marilyn Monroe’s death would not find it. 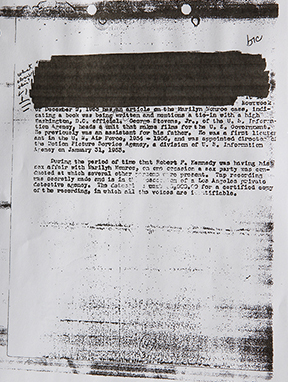 By accident, filmmaker Philippe Mora discovered this in FBI archives while doing research for a documentary film about the 1960’s – a film that was later canceled by the network that commissioned it because it was “too hot.” It reports on findings from wiretaps and that Marilyn Monroe threatened to make public her affair with Robert Kennedy. It describes a scenario in which those close to Marilyn, including Eunice Murray and publicist Pat Newcomb, induced Marilyn to commit suicide and were protected and rewarded for their cooperation. We know that Eunice Murray lied about the day and night of Marilyn’s death dozens of times, including in her book, and she eventually recanted, and Pat Newcomb, who was never compelled to testify under oath, refuses to be interviewed. However, we do not believe anyone “induced Marilyn to commit suicide” based on all other evidence. 3.) Page 2 of the FBI document describes wiretap evidence of Robert Kennedy inquiring to Peter Lawford “Is Marilyn dead yet?” This claim is not repeated in other sources. Though we cannot determine how much of the document is true, the key thing is that it was considered important enough to be read and signed off by so many top officials at the FBI, and it was concealed from the public for about thirty years. We do not know if FBI boss J. Edgar Hoover used this as blackmail in his dealings with Robert Kennedy, who wanted to fire him. We also do not know why Robert Kennedy praised J. Edgar Hoover publicly soon after Marilyn’s death, when it was common knowledge the Kennedy brothers previously had wanted him gone. 5.) This is the CIA document signed by CIA Chief of Counterintelligence James Angleton on August 3,1962, the day before Marilyn Monroe died. It states that Marilyn was ready to go public and “tell all” based on recorded wiretapped conversations. 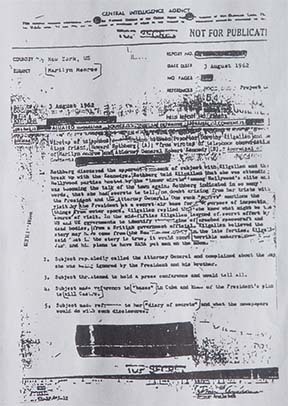 It states that she was privy to highly classified information learned from the Kennedys, involving both plans to assassinate Fidel Castro and also regarding JFK’s visit to a “secret Air Force base for the purpose of examining things from outer space.” Research ties this to the famous Roswell incident, originally reported as a crashed flying saucer recovered by Roswell Army Air Force in July, 1947. Later the official story was changed. The document surfaced from a CIA archivist and does not have declassification marks. The document is legitimate and definitely not a hoax. It was officially accepted by the CIA in an appeal case requiring searching for wiretap transcript. The CIA does not accept a Freedom of Information Act case on appeal unless the document it is based on is accepted by the CIA as genuine. Otherwise, the CIA would have disowned it as a false document, but they did not. Some interpret this as tantamount to a death order for Marilyn Monroe for reasons related to national security, signed by James Angleton. 6.) 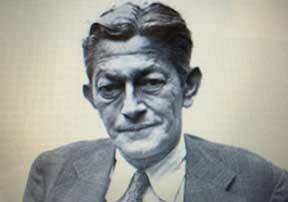 This is a photo of James Angleton, who served in the CIA for many decades as Chief of Counter-intelligence. As the position of Director of Central Intelligence changed from one Presidential appointee to another over the years, none were able to “get rid of Angleton” – he knew too much and was too entrenched. His signature is very difficult to find, but it appears on a CIA identification card published on the book jacket of the book Cold Warrior. It is a close match for the signature on the CIA Marilyn Monroe document which came years later, with the“A” of “Angleton” being identical. 7.) Timothy Cooper is a private investigator trained by the noted and well-established Nick Harris Detective Agency which handled many cases involving Hollywood stars. He studied under Milo Speriglio, a detective with the Nick Harris Agency who wrote two books about the murder of Marilyn Monroe. Timothy Cooper had insider intelligence contacts through his father, who had a career with the Air Defense Command specializing in photographic defense data. 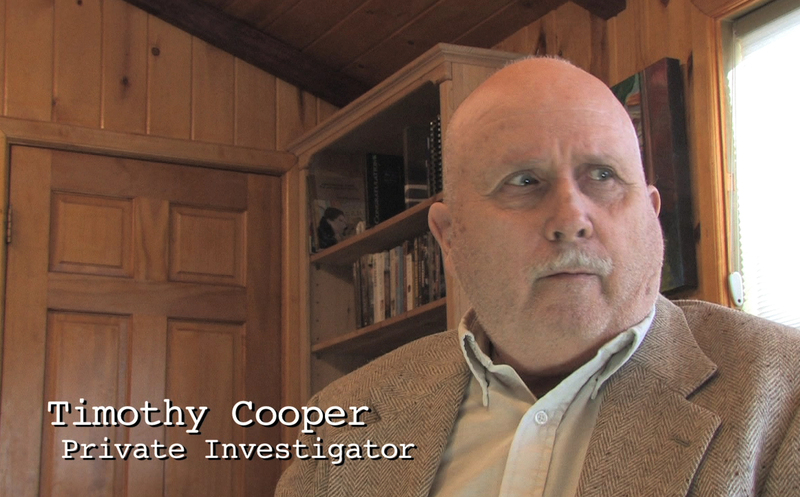 Some of that data, according to Tim Cooper, proved that UFOs are real. After his father died, one of his father’s associates passed a number of documents to Tim that support the existence of a secret military UFO program. The CIA Marilyn Monroe document, signed by James Angleton on August 3, 1962, was one of those provided to Tim Cooper by a CIA archivist. 8.) 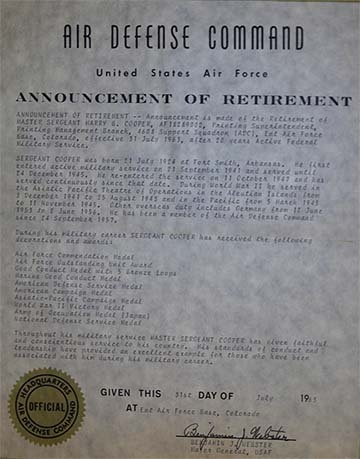 This is the retirement certificate of Master Sergeant Harry S. Cooper (Timothy Cooper’s father) which lists about ten commendations Harry Cooper received for his service in the Air Defense Command. Tim Cooper provided this in support of his contention that one of his father’s associates became a conduit for providing critically important information that has been withheld from the public. 9.) 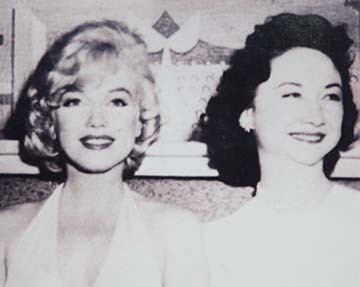 Marilyn Monroe with Dorothy Kilgallen. Kilgallen had a special interest in UFOs and also the JFK assassination. 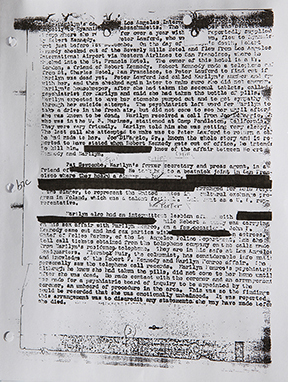 The CIA document above reports on a wiretap of a conversation from Kilgallen, in which secret information Marilyn gleaned from the Kennedys was discussed. Kilgallen’s death, which followed Marilyn’s, was also declared to be suicide from an overdose of bariturates. 10.) President Kennedy with the lady historians have decided was JFK’s main mistress: Mary Pinchot Meyer, a confidant of Harvard LSD promoter Timothy Leary. Leary reported that Mary gave JFK an LSD “trip” in the White House. Mary was married to Cord Meyer, a career CIA official who served under CIA Director Allen Dulles and who joined the agency in 1951. After JFK’s assassination, Mary was also assassinated. She was shot multiple times, including in the head, while jogging in a park near her home. There was no robbery involved. 12.) 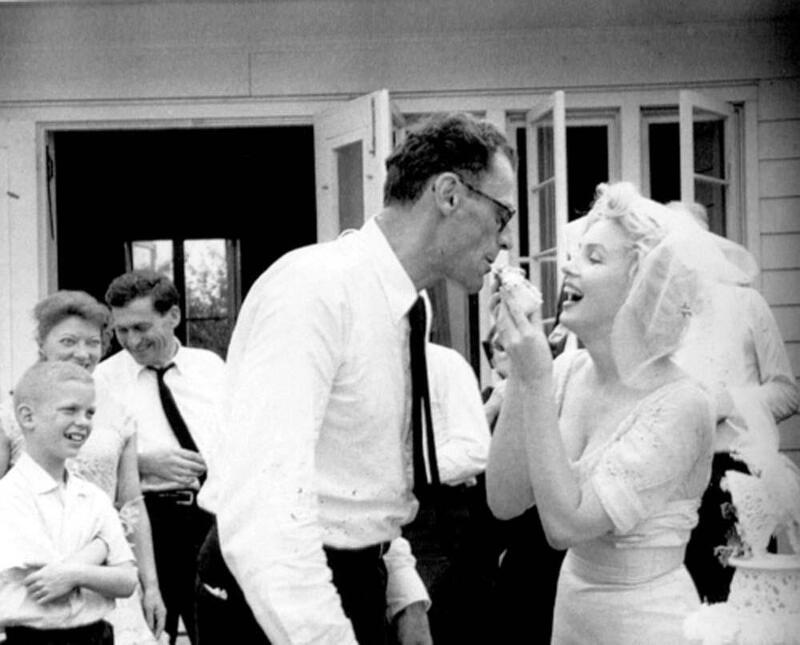 Marilyn Monroe’s wedding when she married playwright Arthur Miller. The marriage to Miller was the beginning of Marilyn’s problems with the FBI, which had her husband under surveillance because of suspected Communist affiliations. He was later convicted of contempt of Congress when he refused to fully cooperate with the House Un-American AcitivitiesCommittee which destroyed the careers of so many writers in the 1950’s. The conviction was later overturned. 13.) 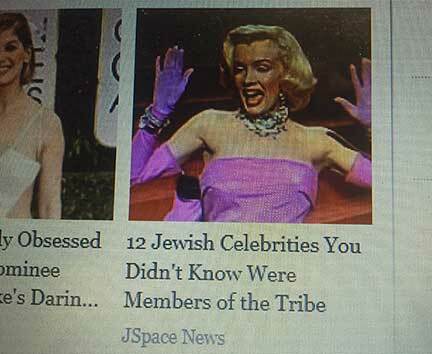 Marilyn converted to Judaism when she married Arthur Miller. From then on she was under FBI and CIA surveillance as a Jew married to a Communist sympathizer, and she was also wiretapped by Teamster boss Jimmy Hoffa who was trying to dig up dirt on Robert Kennedy who had hauled him before the Senate Crime Committee. 14.) 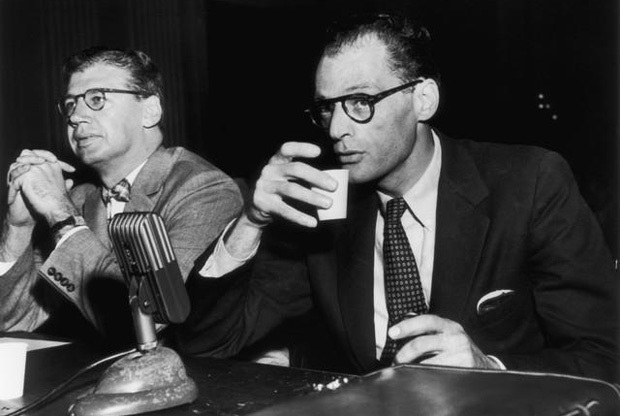 Arthur Miller testifying before the House Un-American Activities Committee. This was around the time Marilyn was filming “The Prince and the Showgirl” with Sir Laurence Olivier in England. 15.) 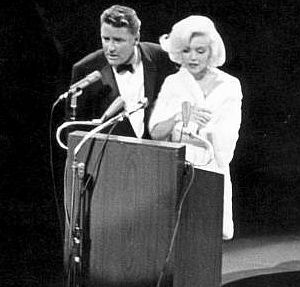 Peter Lawford introducing Marilyn Monroe at John F. Kennedy’s birthday party in 1962. Marilyn’s performance of “Happy Birthday, Mr. President” was perhaps her most famous piece of footage ever. Both Lawford’s Malibu home and Marilyn’s home were being wiretapped and bugged due to their connection with the Kennedys. Lawford, who was married to President Kennedy’s sister Patricia, frequently threw lavish beach parties that the Kennedys attended. Reportedly, it was at one of those soirees that Marilyn and Jack Kennedy first met. 16.) 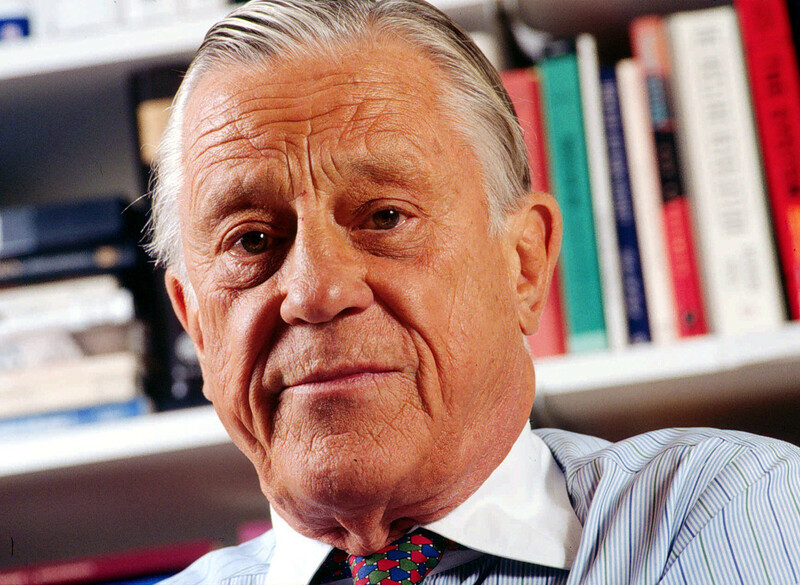 This is Bernard Spindel. 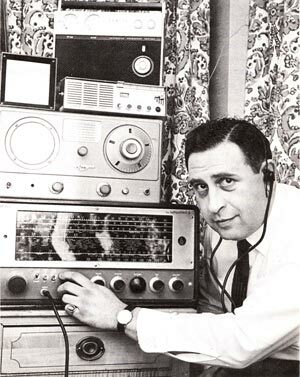 He was the king of the illegal wiretappers, working with detective Fred Otash. He was arrested in a raid on his New York house, and many boxes of audiotapes were confiscated by authorities. Spindel filed a civil suit demanding the return of his audiotapes. 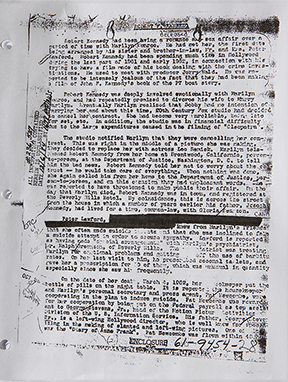 The court papers reference the relevance of some of those tapes to exposing the circumstances of Marilyn Monroe’s death. The tapes were never returned. (They were reportedly “lost” by authorities years later.) Spindel died in prison. Author Milo Speriglio, who authored two books on the murder of Marilyn Monroe, reportedly heard the Marilyn Monroe tapes before they were confiscated. There is no evidence of any backup copy having been made, and the tapes have never surfaced. Skeptics about the murder of Monroe cite the fact that the tapes cannot be produced as a fatal weakness of the murder claims. But is that reasonable? The tapes would not have been referenced in the civil court filings if they never existed.